Upcycling tutorial… inexpensive, easy, and unique props! As a newborn photographer, let’s face it… we are all props junkies. We are constantly on the lookout for new blankets, headbands, buckets, baskets, and of course the cutest hats. It’s kind of a job hazard in my opinion. I can’t go into any store now without trying to find something I can either stick a baby IN OR stick ON a baby. I stalk ETSY and of course a few of my favorite vendor sites daily looking for all things cute. After all of this shopping, things can get rather expensive when most hats alone range from $20-$50+. You want something new and fresh for each session to keep your work interesting and current, but it gets costly. I tried my hand at making my own headbands and that worked out rather well I think. I liked being able to raid my own stash of old scrapbooking stuff (silk flowers, ribbon, buttons, fibers, etc.) and it’s always nice just to play and get your hands dirty… kinda therapeutic if you ask me. Well, after I got tired of whipping those out, the next logical step was to make a hat. I knitted and crocheted a few and they were alright, but seriously… I do not have the time to spend a few hours on ONE piece. There has to be an easier way. Recently, I started seeing a few photographers using “upcycled” props and being the boho chic kinda girl that I sometimes am, I fell in love…. not only with the idea behind upcycling and reusing/multi purposing BUT what I loved most about it was the fact that no matter what, the props would ALWAYS truly be 100% unique. I wouldn’t ever find someone else with the same hat and since I like to customize each of my sessions as much as I can, making my own would easily allow that. Don’t get me wrong though… I won’t ever stop buying headbands and knitted hats, but I think I came up with a way to do it LESS and kill a few birds with one stone. First stop… raid the closet! I went through my old stuff as well as my daughters since her clothes are always much cuter than mine! I looked for sweaters first since my favorite hats to use are always knitted. I didn’t find much so I took a little trip to Good Will and a couple of my favorite thrift stores. JACK POT! I hit the mother load!!!! Every color I could imagine, different textures, thick, thin, and a ton of my favorite… CABLE KNIT! Yum. I was in heaven. Best part is that each sweater was less than $4. Even if I only got one hat out of it, a new prop for under $5? Yes please…. I’m also going to preface the rest of this post letting everyone know that I am in no way shape or form an expert when it comes to sewing. Aside from knowing that I can put 2 pieces of fabric together with a machine that has a needle and thread on it, I don’t really know all that much in terms of technique and making things “perfect”. Fortunately, I already had a sewing machine and I have made quite a few things like aprons, purses, and small craft things. I at least know my way around the thing, at least a little bit. Again, there are probably better techniques, but this is what I know and how I did mine. I will actually be showing a couple of different ones you could make from 1 sweater… and for those who do not have a sewing machine, don’t you fret, there is a super simple no sew one below as well Lets get started! IMPORTANT NOTE: There are some materials that have a bit more stretch to them so always try to go with these when making things like hats that obviously need to fit properly on a baby/child. You will find much more allowance for sizing when using a sweater! After you make a couple of these and are able to text them out, you will know what adjustments you need to make to ensure proper fit every time! 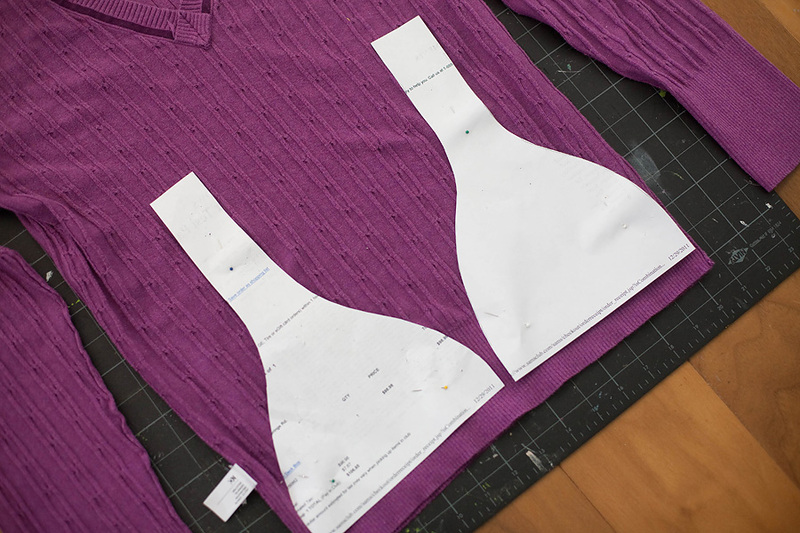 After you have gone and found some sweaters, its best to make yourself a little template to use. 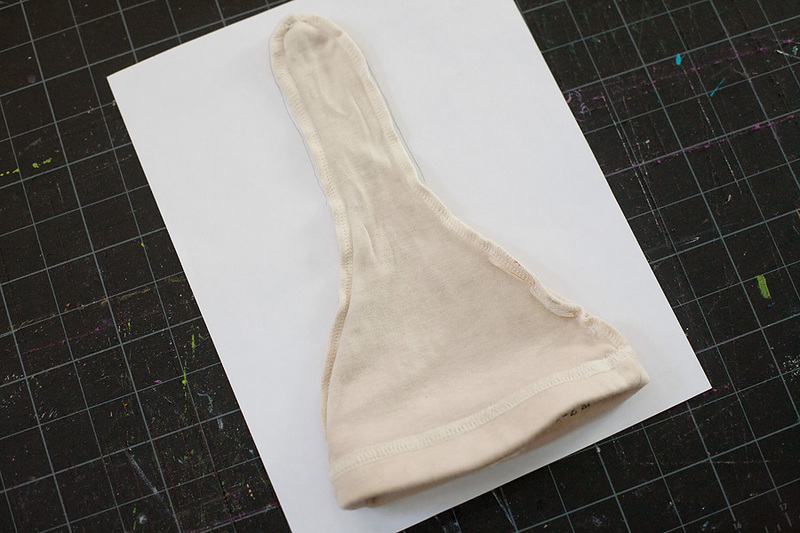 This is something you will be able to reuse each time you get adventurous and want to make a hat so don’t trash the template Again, you may need to adjust sizing and make a new template, but for the most part the basic shape and size should be here! I used a sweet little hat that was given to me by one of my branding clients last year. You could more or less use any hat you have in your prop stash but I suggest using a simple one like an elf hat or even just a beanie until you are comfortable with the sewing machine and learned how to adjust sizing with the hats you make. OK. Turn the hat inside out and grab a piece of paper. Trace along the outside of the hat. This will give you the basic structure of the hat. Cut your template out. Depending on the sweater/clothing you are using, you will more than likely have enough material to make at least 2 hats just from the body. You can either choose to make a girl & boy version OR do 2 different styles of hats (i.e. elf and plain beanie maybe). I chose to do TWO elf style hats so I made TWO templates. Turn your sweater inside out, grab your template/s, and some pins. 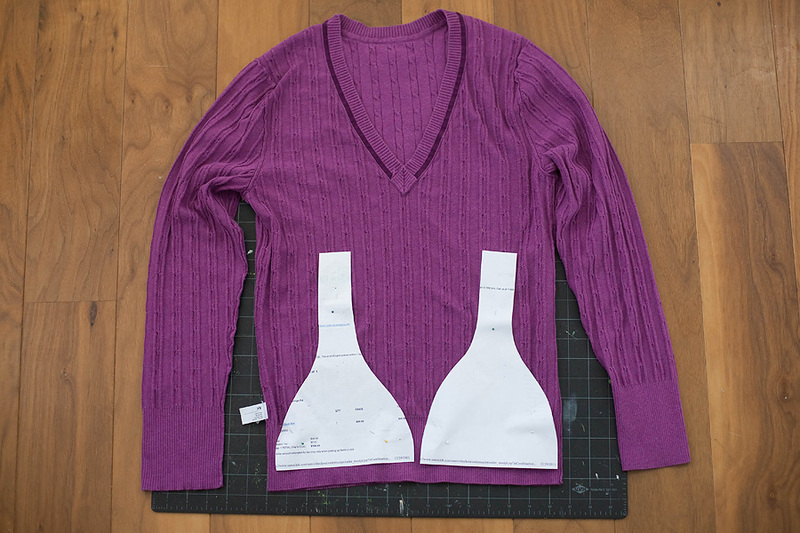 Beginning pinning the paper template to your sweater. I added a bit more length to my template/hat just to be sure it would be big enough. The hat I chose to make the template with was always a bit small on my babies so I figured I would add an extra 1″. As you can see we still have quite a bit of material left! You could choose to trash the rest, but I always feel bad wasting stuff, so I went a step further and tried to maximize my prop output! If you have chosen a sweater/material that has enough stretch to it, you can easily turn the sleeves into a NO SEW newborn hat! Using the sleeves of the garment, simply cut about 10″ UP from the bottom of the arm. If you want to finish off that top edge, add another 1″ or so BUT if you don’t have a dewing machine or just don’t want to sew it, make sure you cut really straight across the sleeve so there are no jagged edges. But wait… you STILL have a lot of material left! Why stop now right? If you were able to cut the sleeves off to use as hats, this is what your sweater should look like more of less. Since I loved the color and texture on this sweater, I thought I would try a couple of headbands as well! First you need to get a nice straight edge. With a long ruler, go ahead and cut along the width of the sweater. Cut those pieces in half or to something that measures about 12″ or so. Again, depending on the type of material/sweater you have the finished size of the newborn headband should be around 14″ I think. My cuts weren’t very straight on my last cut so they are thinner… probably won’t use those ones But try to get 3 nice even pieces for one headband. You should end up with pieces that look similar to this depending on what you have decided to make. On the main hats, remove the paper template and then repin your front and back pieces of each hat together. Starting at the bottom base of the hat (place hat upside down basically), begin sewing until you go all the way up to the top of the hat and then back down the other side. I used a basic straight stitch on this one since thats what most people will have available on their machines but if you have some type of finishing stitch or serger foot, feel free to use that for a nice polished, clean edge. If you used the straight edge like this, simply just trim off any excess to reduce the bulk before you turn it right side out. Once you do that, you should end up with something like this! Time to tie your cute little knot at the top…. and viola! You could easily stop where you are now and have a super cute hat all ready to use for your next session, but why stop there? Let your imagine run wild! You can add some trim, flowers, buttons, beads… the sky is the limit! Since I made 2 of the same hat shape, I thought I would leave one nice and plain and then spruce up the other one. I grabbed a few things from my stash and pieced together a little something. Now is definitely the time to grab the hot glue gun! You could hand sew things, but seriously… Im all about easy! Hot glue=a crafty girls best friend! But wait… what about the NO SEW version of a hat and the headband? Don’t fret…. here you go (and it does NOT get any more simple than this)! Grab one of the sleeve cut outs & some cute coordinating ribbon. Leaving about a 1 1/2″-2″ margin on top, tie the ribbon into a pretty little bow. Um, yeah… you just made a hat in about 2 minutes! Again, you can totally finish off that top edge if you want (and have a sewing machine) or add some cute touches to the base. However, if you have a sweater with neat texture and color, absolutely NO need to do anything else! And for the headbands? Easy peasy…. another under 10 minute project! Lay 3 strips down and be sure they are about 14″ long or so (again, this depends on your material and how stretchy it may be). If its super stretchy, 14″ should be good… if its not quite as elastic, add on an inch. While trying to keep the braid nice and somewhat tight, begin to braid the strips from one end to another. You want to make it tight enough so that its not bulky, but not so loose that you do not see the shape & braids. Continue until you have about 1″ of fabric left. You should have something that looks like this. Now you need to sew the ends together. Grab each end and hold them together. Run the pieces through the sewing machine using a nice straight stitch. Trim the excess off and turn to the “right” side. It should look like this now. Finish off your new head band with a silk flower, trim, buttons, etc. I used a little fabric flower from another sweater I had. You can either hand sew your embellishments on OR just hot glue them to the headband. I used hot glue on mine Just make sure you place your embellishment RIGHT on the seam. This way the seam is totally hidden! Upcycled hats & headband COMPLETE! Totally addictive! Yeah, I couldn’t stop myself!!! Hopefully everything I have done makes sense and you are now inspired to make your own unique props! If you decide to give any of these projects a whirl, I would love to know about it! Please feel free to go ahead and post them on my Facebook wall HERE! Looking forward to hearing and seeing your projects! Happy propping! For those of you on Pinterest, I decided to make a board for people to see my projects as I make them! Just have to add everything, but feel free to follow me there! LOVE IT! What a great post Thanks for sharing something that I can totally do! LOVE this! Thank you!!!! Did you make the yellow and purple flower too??? i’m reading this at work and CAN’T WAIT to get home and try it! Those all turned out adorable… raiding my closet first… i know just the sweater! Thanks so much for sharing! So stinking cute. I love the stitched heart one. Perfect for Valentines Day. But alas, I am not a newborn photographer. Thanks so much for making this tutorial. I have been wanting to learn how to make these! I do not have a little hat to use right now. Is there any chance you can list your dimensions? Thanks. So creative!! Perfect timing, since I just started clearing out my daughter’s closet. Thanks so much for sharing!! Simply AMAZING, Corina! Thanks so much. OMG! those look great, too bad it’s 11 at night and Goodwill is closed. Ah I see a trip in my future! Thanks for sharing! Wow,these are really great,thank you! This makes me want to go and cut all of my sweaters! Thank you, thank you, thank you! Thanks so much for fueling my addiction! My husband should thank you for saving me so much money!!! I came across your site on Friday and right away went to scope out two secondhand stores as well as an arts and crafts store. I bought 3 separate tops and a bunch of felt and accessories and between yesterday afternoon and this morning made 2 adorable pieces. I AM ADDICTED!!! I had so much fun and had to stop myself because I have to focus on editing! Thank you for the inspiration, I have a new level of confidence and now have so many terrific ideas! I think I’ll be spending a lot more time behind the sewing machine and less of it dishing out the bucks to others to make it for me. You are so talented , thanks so much for sharing!! Who knew it can be this easy!!!?? You are so incredibly creative. Thanks for always inspiring!! I ADORE these hats! I recently made a Good Will run for sweaters myself, but for ornaments. I didn’t think about hats too. I’ll have to go back! I can see how it would be addicting. It’s kind of like scrapbooking, but with accessories. Your pictures are fabulous. I’m totally following your upcycled board on pinterest now. Keep those upcycled projects coming!! I just recently discovered upcycled sweaters and there almost always cuter than anything I could crochet or knit myself. It opens hats up to having cool patterns and stitches. For the sweater sleeve ones, have you ever had issues with the unfinished cut portion fraying? It seems like it would all come apart. I really appreciate this great tutorial. Gives me the confidence to give it a try. Thank you so much for this tutorial! I am having so much fun making hats. 1st one didn’t turn out that great but you live and learn and I’m hoping to use one of my DIY hats this coming weekend on a baby boy! Love all of your work! This is one of the most inspiring tutorials in a long time YAY!!! Thank you! I love it!!!! Cant’t thank you enough for all that I have learned from you!!!! The one fact that could be of concern to you is outcomes particularly get the Cheap Chicago Bulls Hats. A+ and 10 out of 10 for that one! Best idea I’ve seen…. I used to upcycle for felting old sweaters into items … never looked at things like this … now that newborn photography is such a large part of my business, this post brings a new obsession to light for my tiniest clients!!!! THANK YOU!!! I love seeing things in a new way again and again! This is so great!! Thanks for sharing. I love seeing you “in-action” photos as well. Beautiful. I love this! But if I don’t have a hat to trace to start with, how do I get the pattern/template? This blog right here is pretty much everything. Thank you so much. I made my wraps from a bunch of sweaters I got at garage sales this summer, but I had tons of scraps I didn’t know what to do with. I’m so glad I saved them. Especially all those sleeves! Thank you so much!!! This was EXACTLY what I was looking for! I just saw a bunch of hats that someone made and was selling for baby props and thought, “I wonder if that would be hard to do…” Turns out, thanks to this, it’s not at all. So excited to hit some thrift stores. And I may need to go through that box headed to Salvation Army. Thanks SO much! Hi guys this blog is interesting for us. I (will|wanna) say thanks for it. Would you be able/willing to share the template for this hat? Thanks! So adorable and I am excited to make my own! Thank you so much for the post. Do you happen to sell the template for the cute hats? I do not have one to trace out and I am dying to try this. good site and good post… i share it now! It blog name fits this project perfectly! Have u seen “under the sycamore” blog, she just shared her camper a few weeks ago, adorable! This site is estimated to be worth $241726077. Thanks for the article. Really interesting. I will definitely use some of these tips! Amazing article and great tips! Thank you!